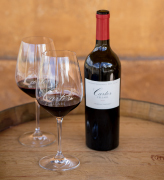 This is the inaugural release of Carter Cellar's Weitz Vineyard Cabernet and we are excited about the opportunity to work with this pedigreed Oakville hillside vineyard. The reddish brown soils are littered with volcanic rocks and the vines bath in the sun from early morning to late in the evening. In the glass, the wine is deep purple to the rim and opens with signature scents of blackberry fruit, cassis and mocha. Notably plush tannins and natural acidity are coupled with a distinct minerality from the heavy graveled soils. In the mid-palate rich blueberry, chocolate covered cherries and barrel spice combine to make this a powerhouse of complexity and structure. Considerable depth and fruit will develop as the structure starts to integrate with a little bottle age. Decanting a few hours will benefit this wine for early drinking; cellar for 6-12 years to enjoy this wine in its prime. 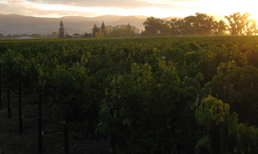 "The 2012 Cabernet Sauvignon Weitz Vineyard is a showy, forward, delicious effort in keeping with the luxurious nature of the 2012 vintage. The tannins are ripe, and the wine shows lots of blue and black fruits as well as a full-bodied, opulent mouthfeel. While it is 100% Cabernet Sauvignon, it is reminiscent of a great Pomerol given its succulence and lushness." 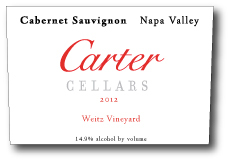 The Carter Cellars 2012 Weitz ' Cabernet has sold out, but other Carter wines are available.